The thing is that Southern belles (who, as we all know, are tough as nails and the real bosses of all the territory below the Mason-Dixon Line) still prefer to appear soft. It is more effective, after all, to look like the magnolia and not the steel. of dawn because they are too busy to work us in any other time. Diva is where everybody comes to get her hair done. They come from Arkansas and the Mississippi Delta and of course from all over Memphis to see Roy, who has been working on the sophisticate angle so long he's almost got it. Roy's father was a hairdresser, and Roy himself has been doing hair for 27 years, which means he must have started at age eight. He and his partner, Ted Cortese, grew up together; they always wanted to do this. Once, at a hair show in Paris, they won all these prizes and they stood on top of the Eiffel Tower and vowed they wouldn't stop there, they'd be the best Now, says Ted, they're in business together, their wives like each other, life is sweet. Roy has patented his own hair color, the only all-natural perm (so you can color and perm at the same time), and his own relaxer for black hair. A company in Minnesota is launching his "high definition" hair color; he's doing a chain of salons. In the summer he commutes to his Gulf Coast condo. He doesn't even do cut and blow-dry anymore, but for us he'll make an exception. "No matter what I say," Roy tells me, "You will hear me finish with the word soft " The first thing he wants to soften is Georgia's hair color. We are back in the land of the natural, as in "I want to get rid of the stripes and make it look a little more natural. The tragic mistake people make when they're highlighting is they do stripes." I don't tell him that in Palm Beach this is not a tragedy but an art form. He's already at work, mixing nine different colors, working with a fine-toothed comb, toning down some of the blond bits, putting his own blond on thin, thin pieces, putting a third, darker color in the back because "hair underneath is darker. I'm starting around the crown where the hair is not naturally exposed to the sun to add depth and get rid of these chunky bits." They are dying to cut Georgia's hair to shoulder length, the preferred length of their clients, but she is having none of it. They are also dying to give her another one of Roy's inventions, the underperm, an all-natural perm on big rods underneath the top layer of her hair to add volume-but she won't go for that either. While she's having her nails done-a soft (naturally) pink-Anne and I decide we want in on this act. Maybe it's the sadistic hour, the lack of sleep, I don't know, but the next thing I know my roots are being done and I'm getting a perm, something I haven't done-for good reason, I now realize-since I was a senior in high school. But Roy says if I do it only from the crown back, it'll add height and volume, just like Margrit's hairpieces. Meanwhile, partner Ted tells Anne he can't see her beautiful eyes, so he takes her straight hippie hair and softens it with a layer or two around her face. Then he tells her if she lets him highlight it, it will look "like two lights are shining on it." The amazing thing is he's right. She's dazzling. Her gorgeous green eyes are luminous, and her red hair looks like it's been kissed with gold. I, on the other hand, have acquired a bit too much softness for my taste. Then Roy assured me as he cut that he was "keeping the line; I'm just making it softer around your face." Yes indeed, but I have been work ing on long Galliano-style waves in front, not a trillion feathers, and a sleek flip in the back instead of hunks of permed layers. I scratch it off to research and worry that the staff back at Stephen Knoll in NewYork is going to kill me,but it is worth it just to get my hair washed by the fabulous Rita, a Toni Braxton look-alike in bright orange leggings who clearly keeps the salon together and with whom I discuss the wonders of barbecue.
. Also, I have to say the color is marvelous, shiny as hell,a totally natural-looking brown. The makeup artist, Lee Keating, leans his head over to show me his hair, also colored and permed by Roy. "Touch it," he says. "Isn't it soft?" It is, actually, and so is Georgia's, really blond but subtle, like the makeup Lee puts on her face. It's a message he's trying to push When I do lessons, I have clients bring their own makeup, and I try to eliminate the blues and greens. Memphis women still paint eyes to match their clothes." On Georgia's eyes he puts maize and almond, and pink on her cheeks and lips to match the nails. "The hotter it gets, honey, the pinker they go." Roy adjusts his color for the season as well. "Starting about February or March, I start lightening it up, so by the time you hit high June it's blond. 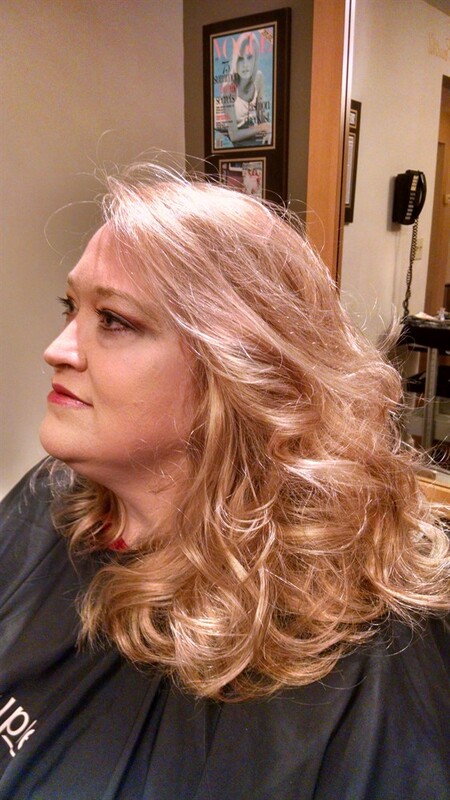 Then I start taking it back again starting in late August, September, , adding the natural color back into the hair." By that clock Georgia has definitely hit high June or maybe even July, but she looks great; she could be queen of the Cotton Carnival or chairman of rush week at the Chi O house. She has lots of loose curls that we casually pull up off her face. Roy tells me he doesn't do updos anymore. Even at night the most he'll go for is a loose French twist. "Look," he says, "if you have a gorgeous gown, nothing detracts from it more. than a big hairdo." It is his last pronouncement, and just hours later it proves to be true. We are at lunch at the Four Way Grill on Mississippi Avenue, profoundly grateful to be eating the best fried chicken and corn-bread muffins in America, served by a very amused Miss Dot, who has never seen a person as skinny as Georgia eat so much. But there she is, munching on a big bowl of turnip greens and a whole plate full of mashed potatoes with her gorgeous face and her new soft blond hair, and the only thing the ladies at the next table can talk about is her dress, a full-skirted red-and-white-checkered DKNY number. "Oh, Lord, I haven't seen one of those in years," referring to the crino- line underneath. "I used to love to wear a dress like that every Easter." "The skirt comes when you sit down, you know." "I know, but I hear those dresses are coming back." Dress discussion out of the way, they finally look at Georgia. "You sure are pretty." Yep, and soft. Jeni DiPrizio, a reporter for Eyewitness News on ABC 24, gave the team of Ted Cortese, owner of and Master Colourist for diVa Colour Studio; Stefanee McGee, of The Brow Cal and Gloe Skin, Body and Nails; Pam John of About Face Cosmetics; and Carolyn Bendall of the Fashion Academy, a lovely palette on whiche to work their makeover magic. At Home in Memphis tagged along for the makeover and asked the experts for answer s to some important beauty questions. 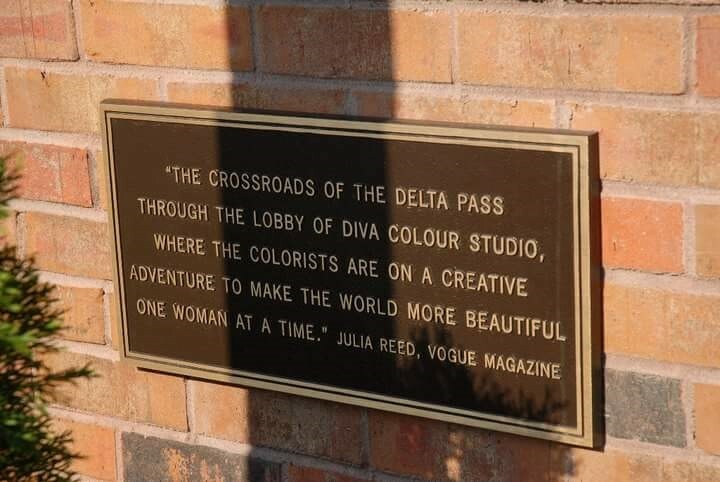 At home in Memphis: diva is known as a "Colour Studio." How important is hair color to the overall look a woman wants to achieve? 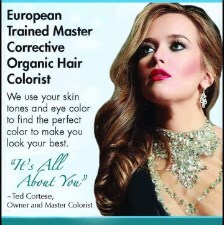 Ted Cortese: Hair color is so important that if the wrong tone is applied neither eye color nor skin tones will be enhanced, no matter what makeup is used. AHiM: Are there any other guidelines to remember when talking about hair color? TC: My belief is that no color should be too extreme. The color of the hair should be better than, not contrary to, nature. AHiM: What did you choose for Jeni and why? TC: We selected a Level 4. Neutral Brown, a carmel color, in layman's terms, to accentuate her beautiful skin and eyes. AHiM: What about the cut? TC: A good cut should accentuate the cheeks and eyes, rather than the chin, nose or mouth. AHiM: What part do cosmetics play in beginning to complete the looks? Pam John: A woman's skin should look like skin. The same as with no makeup, only perfected, with a natural dewy finish. We chose an iced coffee, mineral based powder foundation because is has a nice level of coverage without being flakey or cakey. AHiM: Her eyes are naturally gorgeous. What did you use to enhance them? PJ: Those rich chocolate brown eyes were enhanced using grape in the crease, a lovely champagne color to the lid to "spark" the eyes and a more neutral bone colo9r along the brow bone to further accentuate. part to color choices play in the selection of clothes? Carolyn Bendall: When the color is worn correctly, the skin will appear flawless, redness will disappear and veins will fade. AHiM: How does one determine what colors are right? CB: We match skin tone, eye color and hair color. The three will exact a true match in one spectrum. AHiM: Wha tid you find in Jeni's color analysis? CB: Jeni is a warm tawny with warm skin tones, which can often be misclassified. However, we take it a step further until it's an exact match with no variance. We chose a tailored suite in a buttercup yellow color, which enhanced her beautiful brown eyes and was appropriate for whenever she might find herself reporting the news.